An experiment was carried out to investigate the development and interactions of the flame and shock wave in a newly designed constant volume combustion bomb (CVCB). In this work, a stoichiometric hydrogen-air mixture was used as test fuel. An orifice plate was mounted in the middle of the CVCB to obtain flame acceleration and promote turbulent flame formation. The evolutions of flame and shock wave were captured by the high-speed schlieren photography. The flame propagation was divided into four stages: (1) laminar flame, (2) jet flame, (3) turbulent flame and (4) flame-shock wave interactions. 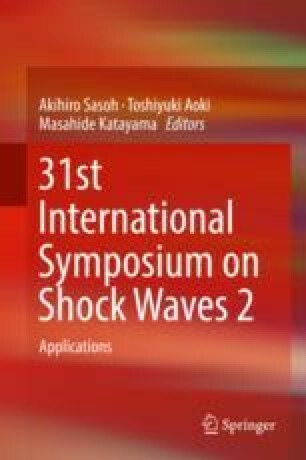 And the development of the shock wave was observed detailedly. In addition, the effects of the initial pressure on the flame and shock wave were studied. The results show that the flame propagation velocity increased with the increase of initial pressure. The propagation velocity of the forward shock wave showed no obvious differences at different initial pressures, but the reflected shock wave from the end wall decayed faster at a higher initial pressure. The work is supported by National Natural Science Foundation of China (Grant No. 91641203, 51476114, 51606133).